The SCA have asked me to draw readers' attention to their new lecture series. See this graphic for details. I apologise to readers for missing this sad news. Sarah Groll, widely known as one of the major contributors to our knowledge of Late Egyptian, died on 15 December at the age of 81. Dr Groll was a student of Polotsky and then of Cerny, and from working with the latter, produced basic studies of the Late Egyptian verbal system. The book with which she was involved which will be best known to readers was the Late Egyptian Grammar. An obituary will be found here. The 'commentary' added by the BBC seems rather inappropriate! My attention has been drawn to the fact that papers from Causing His Name to Live: Studies in Egyptian Epigraphy and History in Memory of William J. Murnane are available online. The late Bill Murnane was a highly respected Egyptologist who died unexpectedly in 2000. My obituary is located on this web site (it appeared originally in the Guardian). The death has been announced of Sergio Bosticco on 23 October, in Florence. Bosticco was formerly head of the Museo Archeologico di Firenze and taught at the university. He had just celebrated his 87th birthday. Bosticco worked for many years at many sites in Egypt and in the Sudan. Phase One of the ‘Oxford Expedition to Egypt Scene-details Database is now available online and accessible via the Expedition’s website. This resource is intended for academic and more general research. It enables users to customize archaeological, bibliographical and chronological data relating to scenes and scene details in Old Kingdom tombs throughout Egypt, as well as on blocks in museums, magazines and private collections worldwide. News concerning OEE book publications and future developments of the database will always be recorded in the Expedition’s website. Reports on the net indicate that restoration works in the Abul Haggag mosque, in the Ramesses II court at Luxor temple have revealed a number of decorate Pharaonic blocks. Some reports suggest that the investigation followed a fire. A selection of links I have found is at the right. The mosque in question is the holiest one in Luxor, possibly in origin a thousand years old (I am no expert on that). The holy man buried there (Abul Haggag) is of great importance to the local population, and his tomb is a place of pilgrimage. Built as it is within an ancient temple, it is inevitable that it must contain ancient blocks in its foundation, but attempts to investigate this have always had to--and must continue to--tread a fine line between interest in ancient Egypt and respect for a very important mosque in Islam today. Several reports indicate that the blocks are Ramesside in date. I am sad to have to pass on the news of the death of Detlef Franke on 2 September at the age of 54, after a long illness. He leaves a wife and a ten year old son. Detlef was well-known among his colleagues as both an excellent Egyptologist and a most likeable person, and he will be very much missed. His academic works concentrated on the Middle Kingdom and thereabouts. His PhD thesis was on terms of relationship, and then he produced a very valuable collection of personal data on officials of this period. His Habilitation was on the subject of the Heqaib complex at Elephantine, and he also wrote many other important papers. His most recent project was a catalogue of Middle Kingdom stelae in the British Museum, which was almost complete at the time of his death. Temporary closure of the Ashmolean's Egyptian galleries: owing to current construction work in the museum's redevelopment project, these galleries will be closed until 5 October. 'Personal Egypt Resources' has been added to this site to include the range of photo and web-log sites which are now appearing in droves. Please let me know of worthy sites and I shall include them. Please note that the old AEB URL is replaced by this one. Following what I mentioned below about Zahi Hawass preparing to announce the discovery of the mummy of Hatshepsut, he has done so at a press conference today. He believes that it is the female mummy first found by Carter in KV60 in 1903, and subsequently examined by Don Ryan and the Pacific Lutheran University in 1989. The key link is made with a tooth in a box in Cairo which is believed to fit into the mummy. 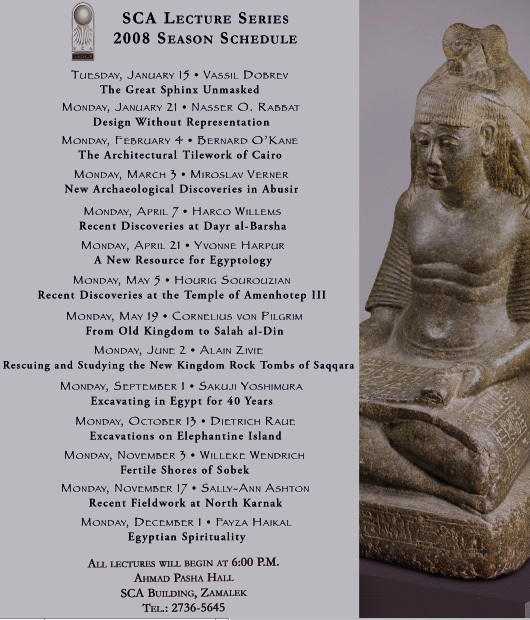 I have been asked to draw readers' attention to a change in speaker for the Glanville Lecture in Cambridge in September: it will now be given by Barry Kemp, and the subject will be Amarna. Update 24/4: I have realised that subscriptions to JSTOR are more complex than I thought. A participating institution does not automatically get all of JSTOR, and so it is possible that the JEA may not be included in what your institution gets access to. This is a major drawback to the system in my opinion. I just got back from the annual meeting of ARCE in Toledo, Ohio. It was a most enjoyable meeting. The highlight for most people would have been the keynote address by Dr Zahi Hawass, on recent discoveries in Egypt. It included among others work at Saqqara, at Giza, at Heliopolis, at Taposiris Magna, and began with the removal of the statue of Ramesses II from Cairo Station. He included an account of the CT scanning of king Tut, and also reported that, having scanned the mummies in the tomb of Amenhotep II, the (in)famous female is not Nefertiti. Further royal mummies have also been CT scanned. He hinted that he will be announcing this summer on the identification of the mummy of Hatshepsut. Sources who have been in Egypt these past few days report that the removal of Qurna is continuing. Estimates put it at two-thirds of the village have now gone. The use of bulldozers does seem worrying in the delicate environment, and I hear that local officials are concerned. Apparently President Hosni Mubarak has visited the site, and reportedly has been consulted on what houses to leave. Update 3/2/07: I hear that there is mention of up to 75 houses which might be left under this scheme. There are of course a number of houses which have important associations with Egyptology; principal among them is the house of Yanni (Giovanni, d'Athanasi), who was an agent for many foreigners who acquired antiquities in Thebes in the 1810s to 1830s. The situation about the new housing for displaced persons is unclear. I have heard that there is a daily lottery for new houses which takes place on the East Bank, and the people do not really quite know what is happening, and are rather unhappy. Gerhard Fecht was professor of Egyptology in the Freie Universität Berlin, and died on 13 December 2006. He will be long remembered for his pioneering work on the study of the metrics of Egyptian literary texts. I believe after his retirement he moved to the area of Heidelberg. I have yet to locate a functioning obituary. Alessandra Nibbi died on 15 January. Sandra Nibbi, as she was known to Egyptologists, founded and edited Discussions in Egyptology; she also wrote a number of books on various subjects, particularly the location of the wadj wer which proved quite controversial in the subject. The SCA have asked me to draw readers' attention to their new lecture series. NOW UPDATED. Some 140 paper squeezes made in TT 57, the Theban tomb of Khaemhet, Overseer of the Granaries of Upper and Lower Egypt under Amenophis III (1391-1353 BC), sometime in the 1850s and 1880s, can now be studied on the website of the Griffith Institute in Oxford http://griffith.ashmus.ox.ac.uk/gri/4khaem.html. The tomb has never been fully published and the squeezes show details which can no longer be seen in situ. Similar records, also in the Archive of the Griffith Institute, made in another two tombs will be published in a similar way in the near future. The SCA have asked me to draw readers' attention to their new lecture series. 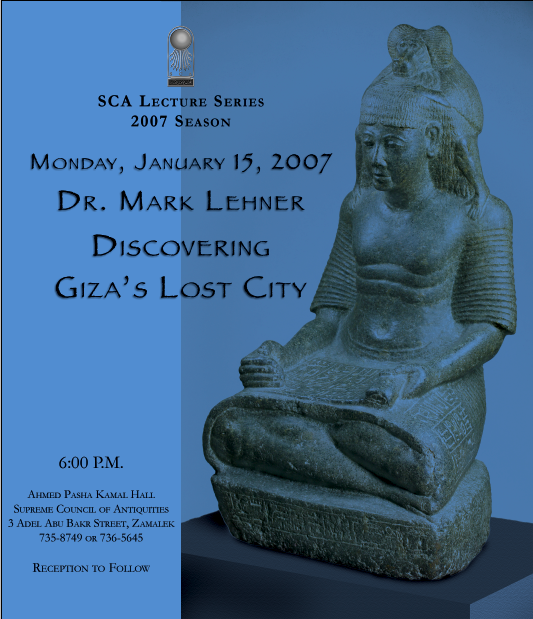 It begins on 15 January with a lecture by Mark Lehner. See this graphic for details.